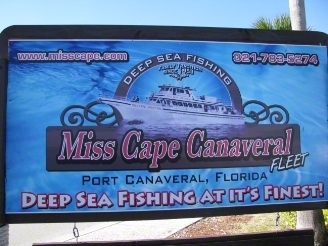 Miss Cape Canaveral has been Saltwater Deep Sea Fishing in the Florida Waters since 1953. For over 59+ years we have witnessed children grow into adults from the time they first started Deep Sea Fishing in Port Canaveral with their fathers. It has truly been a privilege helping generations make Fishing part of their history. We are grateful to all of the customers who have contributed to Miss Cape Canaveral's success and make coming to work fun and enjoyable. We welcome you to become part of the MIss Cape Canaveral tradition, if you are not already, by joining us for a Full or Half Day of Deep Sea Fishing off the Space Coast. It is our crew members goal during your Deep Sea Fishing Excursion to guarantee all your accommodations are met. From the moment you depart from the 2nd largest cruise ship port in the world, the Captain will show you all areas of interest and "put you on the fish", your Mates will assist in catching the big fish you can brag about, and your Galley Chef will see to your tasteful meals!